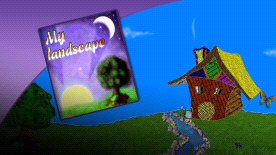 "My landscape" in an original and funny game, Favoring the creativity and the reflection which the scenario is changing in a magical and peaceful universe. It addresses a wide audience and from an early age. As far is the creation of landscape elements come alive, come alive and move. Options make it possible to forecast rain or shine, day and night, choose the color of the sky. A soundscape is created gradually in step with the visual lanscape : The river, birds, wind... And the magic quietly emphasizes the character of the landscape. The emphasis is on the creativity and contemplation.